Online poker paysafecard deposits are now becoming a popular option for grinders of all persuasions, but how can you use this prepaid option to manage your bankroll effectively? If you play at US poker sites, paysafecards make sense. Read on and we’ll show you why. In terms of online poker, paysafecard transactions are one of the most simple and secure methods you can use. Popular across Europe and available for use at more than 350,000 outlets, paysafecard poker sites are just part of a much larger online network. Being part of a global infrastructure means that when it comes to safety and playing poker online, paysafecard is a fantastic option. Moreover, because this prepaid card is accepted at a host of online portals, it means you’ll have much more flexibility with this payment option other than simply playing at your favorite poker room. – Available for deposit – Yes, but only for customers outside of the United States. – Available for withdrawal – No, when it comes to online poker, paysafecard transactions are deposit only. – Money available instantly – paysafecard deposits are processed instantly. – Success rates – paysafecard poker sites offer a 100% success rate. 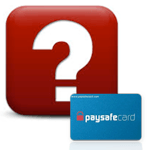 – Fees associated – There are no fees associated with paysafecard poker sites. With regards to paysafecards themselves, the card is free but if you don’t use it for 12 months you’ll be subject $2 per month charge. Moreover, currency conversions are charged at 2% of the transaction amount. To make an online poker paysafecard deposit you, unsurprisingly, need a paysafecard and these can be purchased from multiple outlets across Europe and the US. 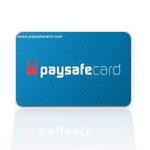 In order to help you find your nearest paysafecard outlet you can use the company’s dedicated app. By downloading the software you’ll be able to quickly find the nearest shop selling all denominations of the prepaid card. Aside from security and efficiency when it comes to deposits for online poker, paysafecard transactions are also a fantastic option for those with a poor credit rating. Moreover, it’s also a suitable payment processing method for poker players that don’t have a bank account. Customers don’t need a paysafecard to make a purchase, nor do they need to disclose their financial details at a paysafecard outlet. Basically, customers can visit an outlet, purchase a card in the following denominations: $10, $25, $50, or $100 and then visit your favorite paysafecard poker sites and use the 16-digit PIN to make a deposit. For those of you who want to deposit more than $100, you can combine multiple paysafecards to fund your account with more cash. 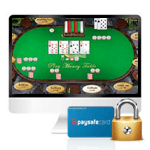 Paysafecard may not be utilized at US online poker sites at this time, but it is available for use at online poker rooms in other parts of the world. Find the cashier page of your paysafecard poker site. Choose paysafecard as the deposit method and type in the amount you wish to deposit as well as the 16-digit PIN. Click “deposit” and the transaction will be processed. You will be granted instant access to your money by Paysafecard in all of our recommended poker rooms. Note: When you play poker online, paysafecard transactions are a one-way street, which basically means you can only make deposits using this method. As the name would suggest, paysafecard poker sites are safe. Because there is no connection between your bank account and a paysafecard, there is no way a cyber criminal can steal your money if you use this method. What’s more, when it comes to online poker, paysafecard transactions are designated as “deposit only”. This means that once you purchase a certain amount of credit, inject it into your poker room account and ante-up, that’s the process over. The chain of command is broken once this has taken place and that means there is very little chance your bank account will come under threat from hackers. Unfortunately, American players cannot use this option to play poker online with paysafecard payments. . Ever since UIGEA came into effect, US poker sites, paysafecard and lawmakers have been at odds and this has prevented players from utilizing this option. Despite customers in America being able to use paysafecard for other online transactions, the company has made it illegal for them to use it for poker deposits. One bright light for USA players is that the law is slowly changing. State-by-state regulation is now in effect across the US and this could lead to an explosion of new paysafecard poker sites in the coming months and years.